Coming from a place where the leaves on the trees turned brilliant colors each fall, I guess having the calendar say that it is fall made me yearn for some color. 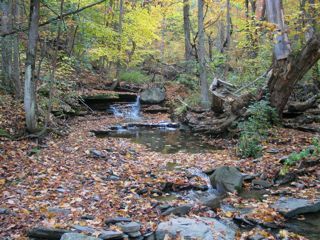 Is there any better way to get children outside than to go check if any tree leaves are turning their autumn colors yet? During your trip you or your children may have some questions about the whys and wherefores of leaves turning yellows, oranges, reds, and maroons. Most trees have green leaves during the growing season. Look closely, however, and you will notice not all the leaves on a tree will be the same color. New leaves will be a lighter, brighter green. Older leaves will be dark green. Leaves that are about to fall off are yellow. How do scientists study the colors in plants? One way is to perform a simple color separation or “chromatography.” The materials that reflect or absorb certain colors when subjected to light are called pigments. In the following test, we are looking for the pigments found in growing plant leaves. The chromatography does require some time, at least an hour, so prepare your children in advance. It also requires rubbing alcohol. I tried to use water as a solvent instead and it just didn’t work. Note: If you are working with small children around, make sure they won’t try to taste the mixture, because of the rubbing alcohol. Read and follow the warnings on the label carefully. Chop up the spinach leaves into tiny pieces. Put the chopped bits into the bottom of the containers. They should cover the bottom in a layer, up to ¼-inch deep. An adult should pour in just enough rubbing alcohol to cover the leaf bits. Stir a few seconds. Slide the coffee filter strip into the container, so that the bottom touches the alcohol/leaf mixture. Rest it against the side. Now wait for about an hour. The alcohol should slowly move up dry part of the coffee filter, carrying the pigments as it goes. The heavier pigments will travel more slowly, the lightest most quickly. Once the wet alcohol front nears the top of the strip of coffee filter, remove it. Check the colors. Lay it on a piece of paper towel or paper and let it dry a bit. Often the colors of the pigments will show more intensely once the alcohol has evaporated. 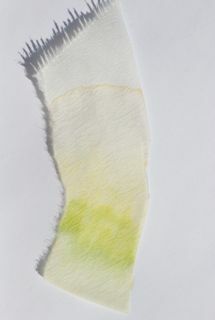 The green bands at the bottom are chlorophyll pigments. The plant uses chlorophyll to convert the sun’s energy into food. If you look closely, there are two bands of green, with some yellow. Those are the two chlorophyll pigments, named chlorophyll a, and chlorophyll b. Just above the green is an intense yellow band. The yellow is a group of pigments called xanthophylls. Xanthophylls make corn yellow. When chickens eat plants with xanthophylls, they can use it in their eggs to make the yolk yellow. At the very top, is a thin orange band. Those pigments are carotenes, named for the first plant tissue they were isolated from, carrot roots. Carotenes are also found in pumpkins and squash. Now compare the colors in the growing spinach leaf to those of the autumn leaf. What colors are the same? What colors are missing in the leaves? What colors are in the leaves but not in the spinach? First I notice very little green in the autumn leaves. 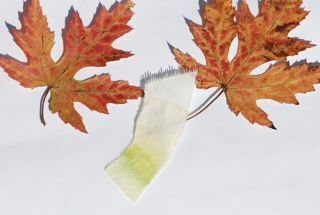 The chlorophyll pigments break down in the fall leaves. I do see the oranges and yellows. The carotenes and xanthophylls have been there all along in the growing leaf, but masked by the deep green. When the green disappears, we can see them. I see another color, however, that wasn’t present before, an intense red. The red pigments are called anthocyanins, and are known for making flowers, and vegetables like beets, red or purple. It turns out that certain trees make a lot of anthocyanins in their leaves in the fall. It wasn’t there earlier in the year. Right now scientists don’t know for sure why certain types of trees produce the anthocyanins. One suggestion is that the anthocyanins act like sunscreen to help protect the leaves while the last bits of nutrients are being moved out and down to the roots for storage over the winter. Another suggestion is that red trees are less visible to insects. Harmful insects may lay their eggs on trees in the winter, and may choose trees that are yellow over those that are red. For glorious photos of fall foliage, go to the Julie Walton Shaver's A Tree Grower's Diary Link at the bottom of the Flowering Trees post. This week, instead of looking at just insects, we are going to take a close look at the flowers of an amazing plant. 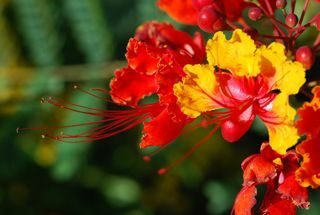 This plant is commonly called “red bird of paradise” or “Pride of Barbados,” Caesalpinia pulcherrima. The flowers are a burst of vibrant color, almost like flames. As a photographer, I love the bizarre structures and shapes. As a scientist, I tend to start asking questions. While taking a few photographs, I became more and more curious about these remarkable flowers. First I found honey bees and wasps walking over the buds in the upper center of the flower cluster, like they were gathering nectar. Sometimes plants have nectaries, the organs that produce the sweet fluid nectar, on places outside of the flower itself. I couldn’t find any text to support my idea, but I did find a photograph. After you click on this link, check the photograph carefully. Look for the whitish crystals at the bases of the interior buds. Looks to me like sweet nectar that has flowed from nectaries and then dried. By the way, nectaries found outside of the flower are called extrafloral nectaries by botanists. Bees and wasps were also visiting the flowers, so apparently the flowers provide nectar too. (There are some plants with flowers that provide only pollen). Next I found small bees and flies that were rubbing on the long, hair-like projections. Those are the male parts of the flower, called the stamens. At the tip of each stamen (the stalk is called the filament) is the anther, which produces the pollen. Look at these flowers. 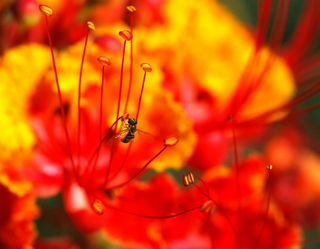 To be pollinated, pollen must get from the anthers to the stigma, or female part of the flower. But first the pollinator must pick up the pollen. Just what kind of pollinator could pick up pollen from the long stalk-like stamens when its head was drinking nectar from the flower interior? The pollinator must be something fairly big by the looks. Who are some possibilities? 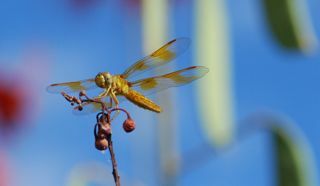 While watching I saw honey bees, carpenter bees, wasps, digger bees, flower flies and even a dragonfly lurking nearby. None of these seemed big enough. The dragonfly was probably catching some of the small flies that were visiting the flowers for nectar. 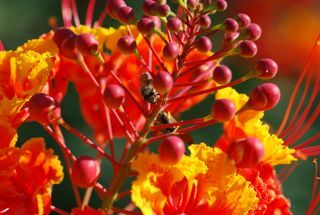 Doing some research, I found that red bird of paradise flowers are pollinated by two different groups of animals. 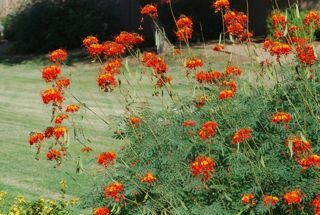 Scientists have shown that the red bird of paradise is pollinated by large butterflies, at least in some areas. Remember the pipevine swallowtail I showed last week? Many of the swallowtails flutter their wings while feeding on nectar at flowers. The butterflies get the pollen on their wings while they are feeding by brushing up against the stamens, then pass off the pollen to the female part or stigma at the next flower they visit. In addition to butterflies, hummingbirds also visit and pollinate this plant. Next time you are in the tropics or other places where one of these astonishing plants grows, take a look at the incredible complexity of these unbelievable flowers. One my favorite books about flowers for children is The Reason for a Flower by Ruth Heller. The illustrations are wonderful. The text is extremely detailed, even though it is in rhyme. How does she get all that information packed into so few words? Be aware there are two places where inaccuracies creep in. On one page she shows the male parts as an anther on a stamen as parallel to a the female parts of stigma on a style. Technically the entire male structure is called a stamen, so it probably should be "from an anther on a filament." Towards the end she also calls a mushroom a plant, which is a very outdated classification scheme. Fungi are now in their own separate kingdom. Look past these technical slips and the book is overall still a gem. Author RobertaPublished on September 22, 2008 June 28, 2015 2 Comments on Plasma: Another State of Matter? Quick, what are the states of matter? If you said solid, liquid and gas you are almost right. Almost? It turns out that many scientists now agree there is a fourth state of matter called plasma, and very possibly others. It is distinct from the other states of matter in its properties and it is extremely common. In fact it is the most abundant state of matter in the universe by far. If it is so common, then why hasn’t everyone heard of it? Or if you have heard of it, why aren’t you really clear what it is? One problem may be the term plasma. Plasma is a word also used for the fluid in blood that carries the cells and other materials from place to place. Same word, two very different meanings, but that happens all the time in the English language. The state of matter plasma is a gas that has been energized so much some of its electrons have come flying off. It can also be called ionized gas, but that is confusing because it sounds like it is just a special kind of gas. Scientists have realized that plasma behaves differently from gas, and is a separate state. To help you develop a better understanding, let’s look at some examples of plasma. A flame is a simple form of plasma, where only a few of the gas molecules have lost their electrons and become ionized. Lightning is a much more intense form of plasma. The sun and stars are plasma. You can even have plasma in your home, if you have any neon signs or lamps. You can also buy plasma balls. Inside the glass ball, electric fields pass through a gas that has been charged to make it plasma. Here is a YouTube video that shows one. If your children are not very familiar with the concept of an atom, it might be a great time to review. One of my favorite demonstrations of atoms uses a pile of oranges and some tennis balls. The oranges are the protons and neutrons and they sit in the center of the atom. You can put a P or N on the oranges, too. The tennis balls are rather wacky and can bounce around all over the place. They are the electrons. If you have gone over the periodic chart, then find some actual elements to create using the atomic mass and atomic number. Choose a simple gas like helium, which has 2 protons, 2 electrons and 2 neutrons. Relate your atom to the gas found in balloons that makes them float. Once you have created a few atoms, now you can strip away the tennis balls, leaving the oranges. Now you have created plasma, a gas that has lost some of its electrons and has become charged or ionized. Note: not all the electrons need to be lost, and not all the atoms have to lose electrons. Only a few lost will be enough. The Coalition for Plasma Science has educational materials and links to other websites. I also found a fun game to help understand plasma by sorting items into the different states of matter at the Space Weather Center. Here are a few plasma balls you can buy for your own experimentation in various sizes and prices. Just remember they are made of glass, and be careful with plasma balls around young children. Published on September 22, 2008 June 28, 2015 Categories Find Out More, Fun Science ActivityTags plasma, science activities, state of matter2 Comments on Plasma: Another State of Matter?